We had our first "garden parties" last night! There was a group of neighbors gathered at the street...a couple of ladies on their scooter-type chairs and several other women and men all discussing the garden boxes...AND another group of us at the far back side of the garden site kicked back in chairs with adult beverages in hand discussing what we're planting and where. They are all very interested in our SFG grids and amazed that Al & I think we can grow "all that stuff" in those small spaces. 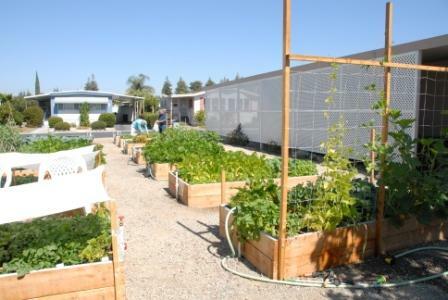 The back lot group has already begun making plans for a harvest dinner/BBQ in late October (yeah, here in Modesto we usually have mild enough weather for an outdoor gathering!) when the moon is hopefully full. 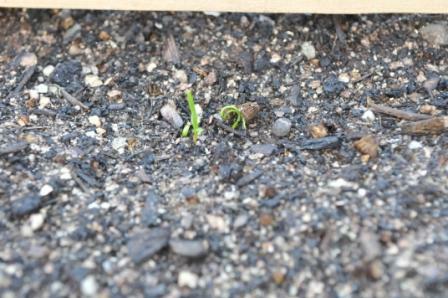 We are all so full of hope and anticipation, and just plain ol' JOY...each day the beautiful soil feels better and better...you'll probably hear us all whoopin' and hollerin' when we see our first tiny sprouts! It looks like you ran the irrigation lines long (in the pic where Al and Joe are covering the trenches) just in case some of the 'outsiders' start thinking you're on to something good, and decide they want one too! You're right, Boffer...when I first drew out the plans I included enough pipe for two more garden boxes...just in case! Yep, last week we had two people ask if they could get in on this. Our park manager sorta shook his head, smiled a bit, and said "maybe in a while" when I asked for 12 more boards. Al and I extended the pipes beyond what might be the two additional boxes and added extensions on the sides, then capped those extensions for possible small flower boxes across the front of the whole garden site at the street, just to make it all look pretty! Today we had another person asking about the garden sites...I'm hoping the managers will allow another empty lot to become a great community garden site before Spring! OMGosh!!! We've got sprouts!! We planted our first seeds on Saturday afternoon, just days ago on July 31st and today in the morning, August 4th we've got sprouts!! Al came in this morning all excited about his 3 squares...2 of Rouquette/Arugula and one of Champion Radish that had sprouted. Around noonish I went out to give the boxes a light misting to keep a crust from forming and I nearly dropped the hose when I saw sprouts in MY garden box too! I had to run back to the house to get my paper garden plan to see what was where and found I have Chinese Mustard aka Gai-Choi, Olympia Hybrid smooth-leaved Spinach, and Tyee Spinach, another slow to bolt variety. I was so excited I just did a little dance all by myself!! Al came home for lunch about 30 min later and I had to show him...and more have popped their little heads out of the ground! My garden box is just MM and Al used mostly MM but added some other stuff too. A couple of the other gardeners were out there this morning and when I told them Al had sprouts they just said "No way!!" and then when they saw the little guys they said they thought it was very appropriate that Al have the first sprouts with all the hard work he did. I agree! 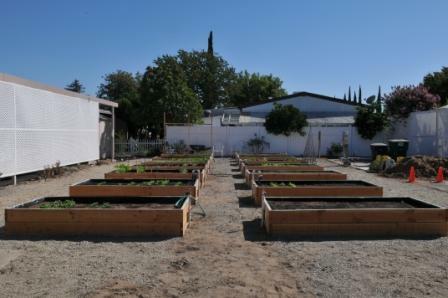 As of yesterday evening all the faucets were installed and each garden box is now completely ready for planting. Some of the gardeners have planted a few things, some have completely ignored the boxes for over a week. I hope those who haven't had time, or wanted to work in the boxes will give up and let me assign the boxes to some people on a waiting list...yep, as the word is getting around and people stop by to see what's happening, we've got much more interest. Even our Park Manager came by this morning after I called to again thank him for all the supplies, and to let him know we had sprouts. He had a huge smile too...everyone seems to like seeing stuff grow. Chopper, you said it well with "a garden brings more to life than just plants"! Here we are again, a week later with some new pics to share. In addition to having a great time with our community garden boxes, everyone is also a bit competitive...especially between us, Al and Sheila! 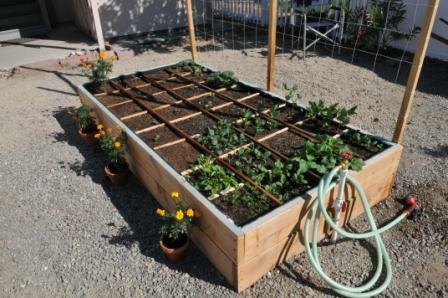 My garden box is "by the book" and Al added other soil amendments to his. 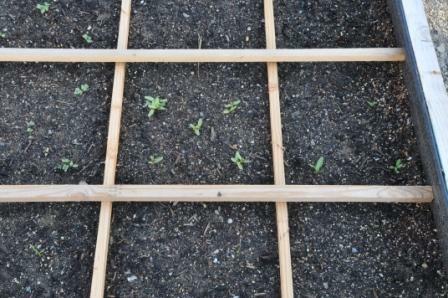 One of our other gardeners made squares and planted within her squares, but is using regular Miracle Grow and no vermiculite or anything similar to hold the moisture. Everyone else is doing row planting. 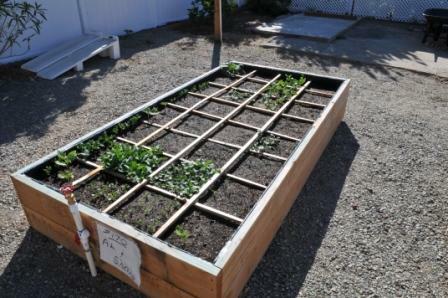 Almost every one of the 14 boxes has something growing, mostly radishes. One person planted peanuts and bush beans in one box and potatoes and bush beans in the other...interesting! Most of the gardeners are absolutely soaking the soil either by hand or with timers set for a minimum of 10 minutes...in 4'x8' boxes. So far Al and I are hand watering a few times a day to keep the soil from forming a crust on top. Oh, yeah...I tried Mel's suggestion of pre-sprouting some seeds on damp paper towels...works soooooo well! After marking a paper towel so I would know what seeds were where, I placed a few broccoli, cauliflower, and cabbage seeds (tiny little things!) on the damp towel that was on a plate and slid the plate into a large plastic bag, much like a terrarium. 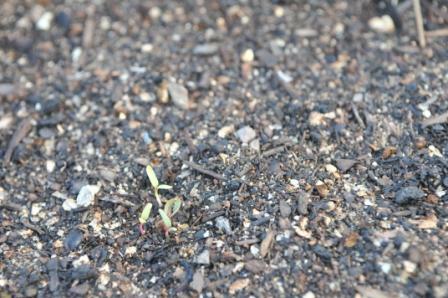 After 1 and a half days they had all sprouted, every one of them! I cut the paper towel and placed the little pieces into the soil and gently covered them...and to my absolute and total amazement...the little guys were above ground barely 24 hours later...no kidding!!! The rest of the gardeners are beginning to not like me so much!! What everyone is asking now is...just what is in that soil?? And of course that starts the whole discussion of SFG and Mel's Mix! Planted 31 Jul and up on 04 Aug! 10 Aug, Sheila's garden box with Marigolds. My dad sprouts these flowers for me every year. 10 Aug, another view of what has popped up in barely 11 days! 10 Aug, sprouts grown in a different mixture but from the same seed packet as those in Sheila's garden box with all Mel's Mix. Amazing! 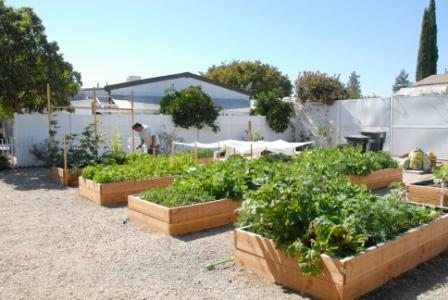 Ya know, it's kinda funny how people who pooh-poohed the idea of the garden boxes as a community thing are now coming around and wishing they had been part of the project! I just came back in from the garden site, smiling to myself over the comments a neighbor made. He and his wife were some of the original people we approached to be part of our project but they said they had all the garden space they needed, too much work, not enough time, etc, etc...but now that the little sprouts have sprouted, and more people are admiring our hard work...this guy now says if anyone gives up their garden box he will take it. My "waiting list" is growing almost as fast as the sprouts! I have been waiting for pics !!! Your project is one that comes to my mind a lot !! I love seeing the pictures your ideas are great!!! Keep sharing .. its awesome. I love it. and I love the idea of presprouting and then planting the sprouts, towel and all. Beautiful beds. Your will rule, of course. Next run up the 5 I will have to take the 99 instead and take a peek. BUGS...and other four letter words! This is not good!!! Yesterday I found some little white marks on my squash leaves and small bright green bugs on the underside of the leaves...Yikes!! I used an insecticidal soap on just about everything and this morning I'm finding more plants with bugs eating them! Two of my very tiny cabbage sprouts are just cut off at the ground...so sad looking, just toppled over and shriveled...and they were so young! One of my other plants has some holes in the leaves...what in the world is happening in my beautiful garden????? 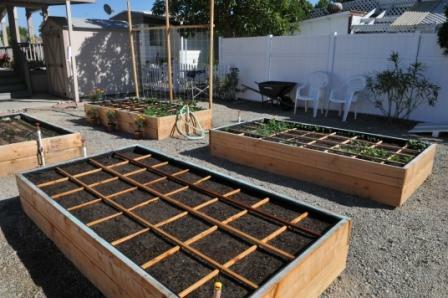 How do they find raised beds in an area that didn't even have a garden before???? Bt (or thuricide) for worms. Thanks Chopper! I was out there about an hour ago and there were very few, but still some of the little green bugs and the white flies on the under sides of the squash leaves and some of the bean leaves. We also seem to have a "helper" in the garden...several of our garden boxes are being watered by a phantom of the garden...no one seems to know who is actually doing the watering but I think that's the reason I lost the two tiny cabbage sprouts...they looked like a stem rot thing. It's been about 10 days since we reported anything...the phantom waterer is still soaking several of the garden boxes. Al has been up at 5am to try and catch the culprit with no luck. ALL the boxes look great, everyone is happy with the growth and the guys from the main headquarters loved what our garden site looks like...YAY! 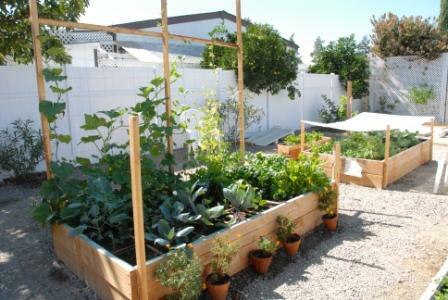 He even suggested we put in more garden boxes, and a sink, and a compost area, and maybe a small green house, and...yep, even a table, chair, umbrella area for folks to just watch stuff grow! 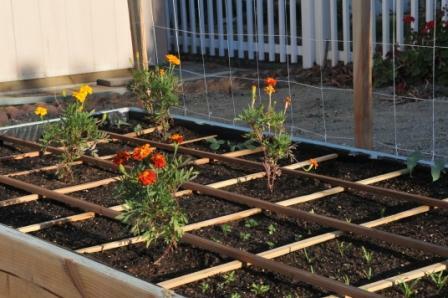 This is EXACTLY what I had in mind when I started this project several months ago...I am one VERY happy garden girl!! Nearly every box is growing green stuff! Quite a variety of planting methods! Al's plants all doing well! My two week old garden with the flowers relocated to pots for more veggie planting! Those two chairs provide the best seats in the garden to watch things grow! 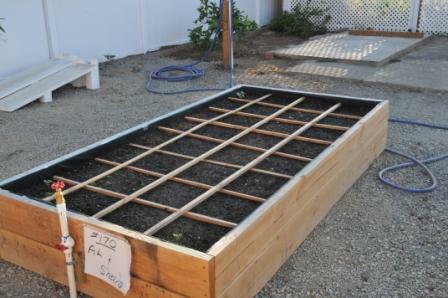 ...and the box that looks empty has each square planted with some type of herb. Very slow to sprout and making Al crazy! I forgot to share something...how I got rid of the aphid problem, sorta. I was freaking out a week or so ago because I found so many of the little critters and their cousins on the under sides of the leaves of many of my plants. The "soap" method didn't work and obviously the Marigolds weren't doing their thing either. I thought about what other things might work and then remembered what works best ON me...the thing I always use to keep the flies, bugs, and biting no-see-ems off me...and you're gonna laugh...but I used a diluted solution of Avon Skin So Soft and water in a spray bottle!!! 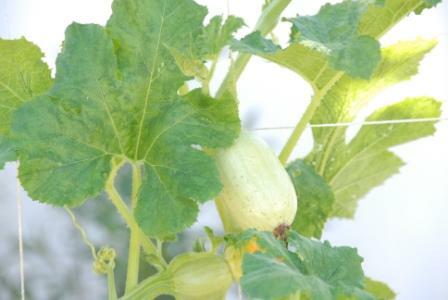 Now even some of the other gardeners are using the bottle I leave out in the garden on the back side of my garden box. Yeah, I know...all the studies say this stuff doesn't work for mosquitoes but I know it works for me. Now I know it also keeps those darned little damagers off my pretty green leaves! I searched around and read somewhere that one of the ingredients is carrot oil...not sure how to get oil from a carrot, but hey, if "they" can, and it's working...YAHOOIE!! When you guys get back up off the floor where you're rolling around laughing I'd love to hear your comments, suggestions, and other helpful hints! The good part is we've also seen lady bugs, dragon flies, and a praying mantis in the garden...hopefully they like it well enough to tell their friends to stop by and enjoy the bug buffet! Our weather changed again today...instead of the triple digits of last week we're in the 70's and it's cloudy. We actually have a chance of sprinkles this week! The plants seem to love this weather and are growing in spite of the darned little bugs. Al harvested some of our Arugula and shared it with our neighbors and we've now eaten a small amount of our Swiss Chard. These all were planted from seed on August 1st...we're more than delighted with the results of planting mostly in Mel's Mix! Feel free to send along any suggestions for diverting that bug highway, OK? If nothing else, it would make you feel better! If it makes you feel any better, this seems to be the month for moths and worms. I have not had any real problem with bugs until this month - in So Cal - Inland valleys. And I had been watching with an eagle eye since March. This (mid-aug really) is the first month for aphids and for the butterflies and their young larvae. So a lot of what you are dealing with is timing. I have also seen an influx of ladybugs and others and I am not seeing enough damage to get crazy yet. You are a new garden without a lot of vegetation nearby so you do not have the balance there yet. So having bugs is not the same as losing a crop and you need to watch to see if that is happening or not. If so - for organic gardening the big gun is neem oil. And a step up from there is pyrethrine and rotenone - which will definitely kill your beneficials too, but should get the job done. Do not be discouraged because there are bugs. It isn't about having a bug free garden, it is about having a decent harvest. The real plant killers are snails, slugs and varmints and those you do not have to worry about. Chopper and boffer, thanks for the great suggestions...umm, I think I'll bypass boffer's for now, but it's sure a good thought and definitely made me smile! The entire garden site makes me smile every time I walk out there. 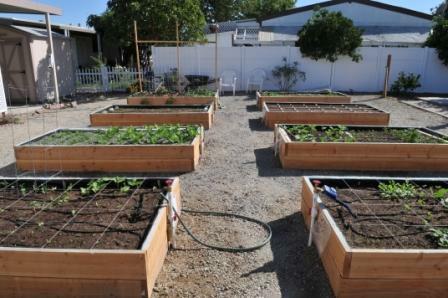 More and more neighbors are stopping by to chat and admire all the hard work that's gone into these 14 garden boxes. Each different gardener adds their own expertise and opinions on how to handle the bugs, and a few neighbors tell us how to do it too! We don't have critters in the garden boxes, not even the feral cats in the park...and we don't have slugs and snails. We probably won't have slugs and snails unless they're imported in with some plant purchased and planted. For the most part all the gardens have been grown from seeds. And now for the exciting news...our Manager told me last week that we're getting a greenhouse too!! If I thought I could have turned a cartwheel without killing myself I would have cartwheeled all over the place!!! I don't know the size of the greenhouse but hey, we'll accept anything! Enough for now, I'll post updated pics later today. Oh my goodness! I just read this entire thread! What a fabulous story! You have every reason to cartwheel and dance and be so proud of your accomplishments. I wish every community had a PNG Grandma! Wow, I can't believe the time has flown by since my last post! I was out of town last week and didn't see our gardens until Sat evening when I returned. I couldn't believe my eyes! Every box had huge plants, well, huge-er than they were when I left. Most of the gardeners were out on Sunday tending their boxes, comparing and sharing ideas to win our war on whatever is eating our stuff before we get to harvest and eat our stuff! A couple of the boxes, not next to each other, have had all the carrots absolutely stripped. Other boxes have beautiful carrot tops growing. Some have turnip leaves that look like great grandma's crochet work and others are doing just fine. We're still finding Harlequin bugs, and lots of Lady Bugs. The pretty little white butterfly is still flitting all around and we're still finding her children...chomping on all the beautiful cabbage leaves. The bush beans are bloomin' and producing like crazy but the snap peas are hating the heat we're having this week. We're back up into the high 90s for the week...guess our summer is late this year. 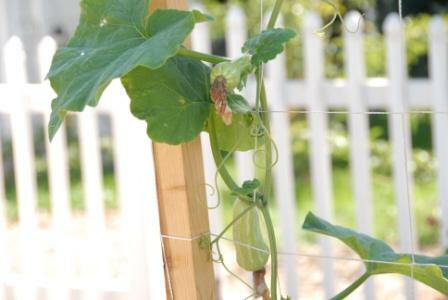 My butternut squash and spaghetti squash plants are taking over the trellis and crowding out my yard long beans...and these little guys just might grow almost a yard long...they're well over a foot long right now! 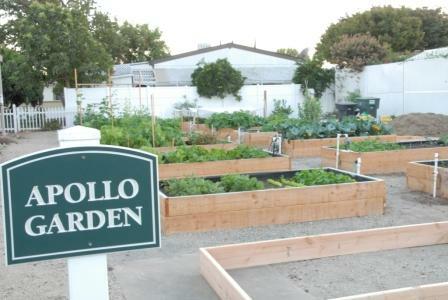 One of my big surprises when returning to the garden was the really nice sign put up by our park managers...we are officially known as the Apollo Garden, named for the street where we live. There is now some talk of doing another lot in the park for next year so more neighbors will have the same enjoyment we're having...I am SOOOO excited about it! I mentioned our garden is the prototype for other parks owned by the same people...well, they've asked me to put together a "How To" pamphlet so the others will be able to do the same thing. I am jumping for joy again...my simple idea to keep food on our table, help neighbors grow stuff, give to those less fortunate, and eventually give to the local food kitchens is now becoming a much larger project and spanning more of our State. How awesome is that?? Al is watering our garden boxes. 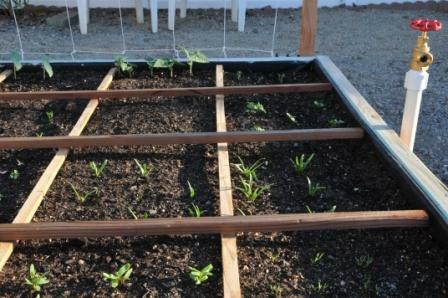 You can see the covers he put on his to protect the lettuce and smaller plants from our heat this week. The other boxes are just overflowing with goodies! This is my garden box, just growing like crazy! The Butternut Squash doing well too! Hope they hold on and don't fall off the trellis! We are the Apollo Garden...with so many neighbors stopping by to admire our work. You can see the new boxes being added...2 4x8s and 4 4x4s along the driveway side. How wonderful your garden is growing. I think it is marvelous that the owners gave you a chance and now see what a great addition it will be for all the properties. It took a lot of work on your part, but the results are great. Wow! What a great service you have done for your community. And what fun for you and your neighbors. Isn't it great to combine the two? I am driving by the Wed before Halloween so I hope to be able to see it then. If you are not around I may sneak in anyway but I will be in contact. Hey ander217, I'm sorry I didn't include my thanks for your really kind comment about every community having a PNG Grandma! It's taken me until now, in my 60s to realize this just might be my "purpose in life" ...with my genealogy research I bring families together and with my garden project I bring neighbors and strangers together. ALL of it makes me very happy and content with my life...I can't imagine anything better.